A corner in an abandoned asylum in Pistoia, Tuscany. 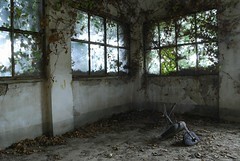 Featured on The beauty of urban decay by Robert Bowen on Smashing Magazine. Thank you!